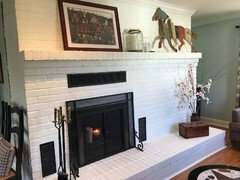 Please help me decorate my looong fireplace by EASTER!! This thing is 12’ long and all brick. I’ll do a nice candle arrangement in the fireplace. Is there too much going on in the bottom part? I made good use of some fallen branches from the yard. I need a bigger container for them. The top half needs help. HELP please! Having family over for Easter and this little nook adjoins the dining room. The candles on the top part are too small - I have some extra bricks outside. 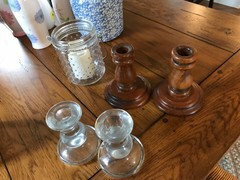 What if I paint them white and raise the candles up by two bricks and spray paint the base of the hurricane lamps aged copper? 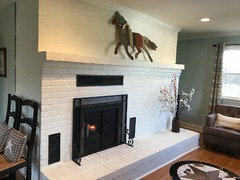 I think you some color and height on the mantle. 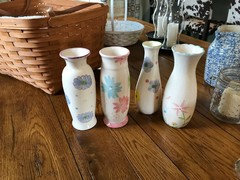 Set of 3 vases/candles or something - not clear glass though, because the current glass candles get lost in the white brick. 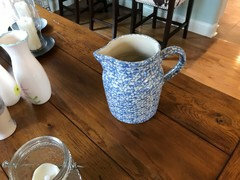 I’d either shop your house for other items to rehome for your gathering, or to a home store and look for a set of 3 “items” in an accent color that compliment your furnishings, not all the same size though. Don’t try to over-decorate. 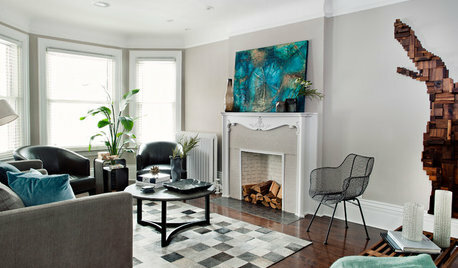 While you have a huge space, go for a handful of larger/taller items and leave some white space, rather than fill it with stuff. I’ll see if I can find some inspiration! 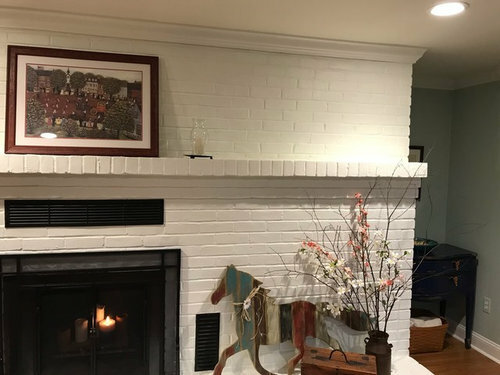 Couple pics here - see how the items on the mantle contrast with the background. And the varying heights/sizes. 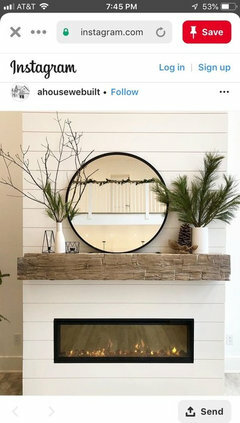 I think you have too much on the bottom (hearth). Keep the fireplace tools where they are and remove the jar/candle. Try centering the horse to the right of the firebox...nothing else. The framed art on the mantel is fine to me (looks like a Charles Wysocki print?). A black frame might be a better fit. The hurricanes and candles you have there now look lost against the white brick. 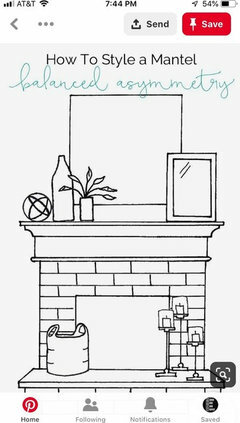 The right end of the mantel might work with a grouping of (black) candle holders in different heights. Make sure it's an odd number...3 or 5. 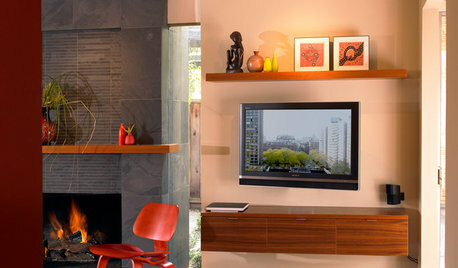 Mantels and hearths are best when kept simple. Some open space is just fine...and calming. Move the horse plaque up top. Put all 3 candles on top, to the right of the painting, putting one of the smaller ones on a book to raise it up. Your goal is to have 3 different heights. 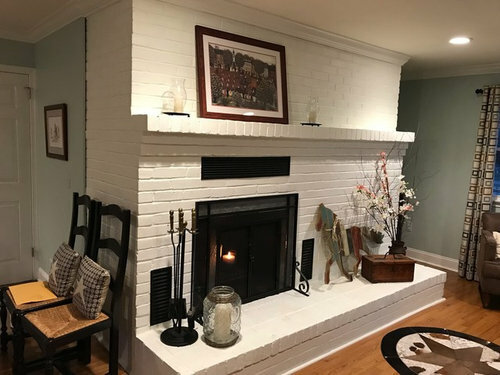 Move the fireplace tools to the right of the fireplace. Leave the branches and wooden box where they are. I wouldn’t add too much stuff or overdecorate. Try this and take another photo. Yes! 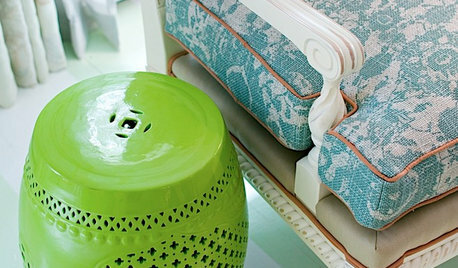 I like the ideas above - repurpose some of the items below up top. And would also like to see an updated pic!! 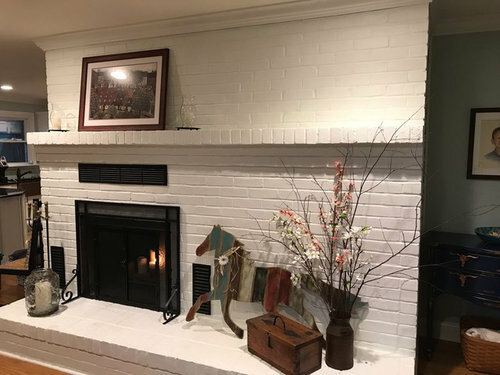 What if I dry brushed random bricks above the mantle the same color blue as the walls? 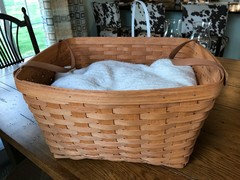 Just lightly, to give it some weight without adding clutter. Personally, I wouldn’t. 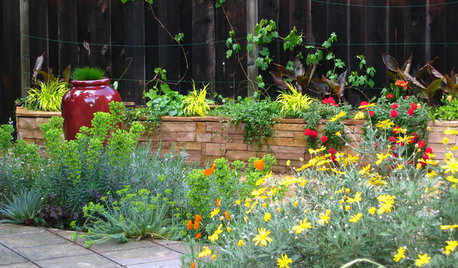 The brick is beautiful and a perfect backdrop for so many options! I don’t think you need to do a lot of work- just a matter of rearranging what you have - and maybe adding or swapping out from other areas of the house. You’re totally right though- you don’t want to clutter it up. Just add a little more height on the right side, maybe something nearly as tall as the artwork? I wouldn't do that. Keep it clean and simple. 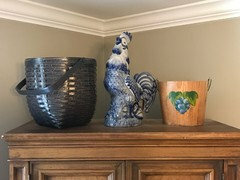 Easter Decor belongs on your dining table : ) and should reflect SPRING...... more than bunnies : ) You already have too much on the raised hearth. 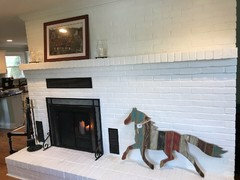 The horse alone over the mantel, center it, and ignore the fire box ( the family photo somewhere else ) and a larger vase more branch alone on the hearth. Done. All else.....out. I like option 2. 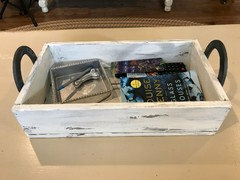 I would put the fireplace tools to the right of the fireplace, along with the branches and box so that you have a grouping of 3 items together. It’s more pleasing to the eye. Try putting the horseshoe candles to the left of the painting. Oprion three! Less is far MORE! A larger more important vessel for the branches, add the wooden box if you like. Then spell STOP !!!! Wow...you are a real trouper to go through all this! I actually prefer Option 3, but I'm more of a minimalist. 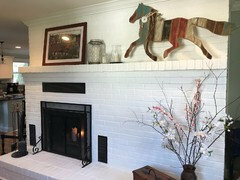 The horse looks good to me by itself on the mantel. 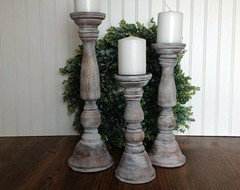 You could try centering it over the firebox, then place a trio of dark candle holders to the right in varying heights. For me something darker would look better against the white brick than clear glass. 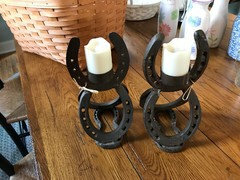 I see you only have two of the horseshoe candle holders, and they don't look quite tall enough to me. Maybe a trio similar to these but darker...like the darkest stripe on the horse. Jan, TWO? What about THREE? 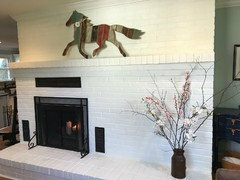 Centering the horse above the mantel (option 3) only emphasizes the asymmetry of the fireplace. It is jarring to the eye. BTW......did you guys get this tidbit? "havingfun" a frequent Houzzer commentor, passed away Saturday evening 4/13. 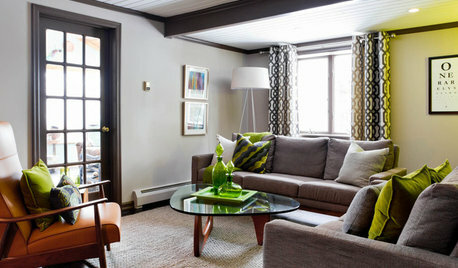 Got a Houzz email from her DH this am. With that, you've told a nice "story".......and all the rest? Not on the mantel.....not on the hearth. Curate.......edit . 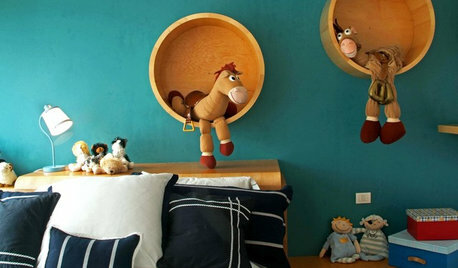 I haven't been on Houzz that long but do remember numerous posts from havingfun. What happened??? No idea what happened to her. I do remember , and he mentioned it in email, that she was very much confined to her home for medical reasons. I also remember her mentioning same in many comments she posted. A sweet DH, to consider her affection for this site, and even bother to send emails! Clearly something very important to her daily routine. I am reminded of Sophie W. ..........and the rest I need not say. Right? Geez, that's so sad. She seemed to have a good sense of humor...hence the screen name. I agree her DH was sweet to realize she enjoyed posting here and let you know via email. 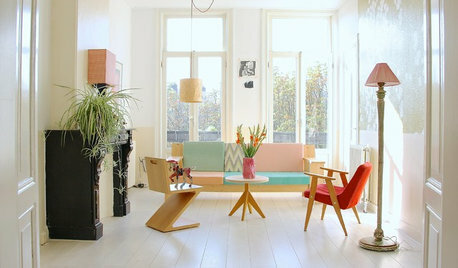 Less is definitely more here, otherwise it all begins to look cheap and tacky, and that would be a shame. 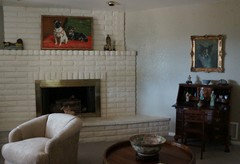 I have a rather similar fireplace, although mine at least has the firebox in the middle. I hope you don't mind if I add a picture of mine because it's so very similar to yours. I tried to keep it simple. If you don't use those fireplace tools I would eliminate them. Don't have anything that you don't love or that you think is beautiful. I love your horse-shape...stand? It matches your home:) Where did you buy that? My home has the same style as yours, but I fix the frame on the wall and replace it with a @HDgenius digital one for my parents. They love to see my photos switching even I do not live with them. 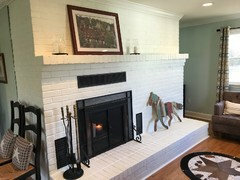 Please help me decorate my family room! I need help decorating my dining room and living room, please! Please help me decorate/rearrange my living area!!! 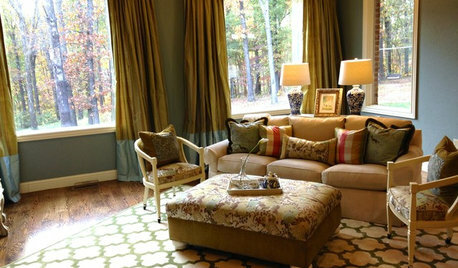 Windows and rug recommendations please!! !